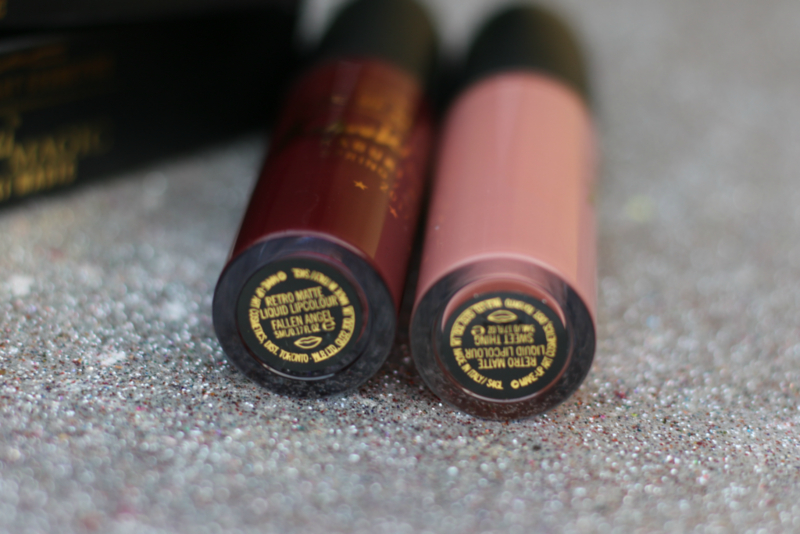 In this post I will be featuring 2 of the MAC’s new launches. 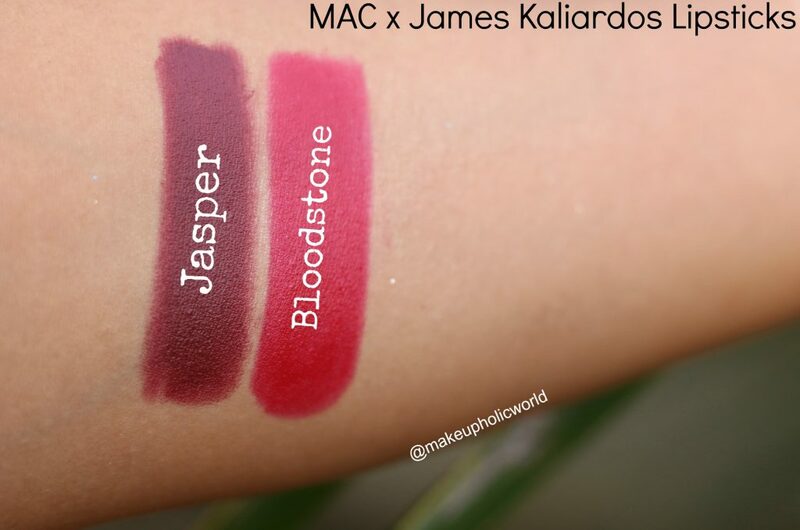 M.A.C Makeup Art Cosmetics Retro Matte Liquid Lipcolours – Fallen Angel & Sweet Thing ; M.A.C Makeup Art Cosmetics James Kaliardos Lipsticks – Bloodstone & Jasper. This is one such collection which I really awaited for. The heart and soul of M·A·C Cosmetics comes alive backstage through the art of makeup. Our Artists, masters of their craft, create beauty looks that impact the runway. 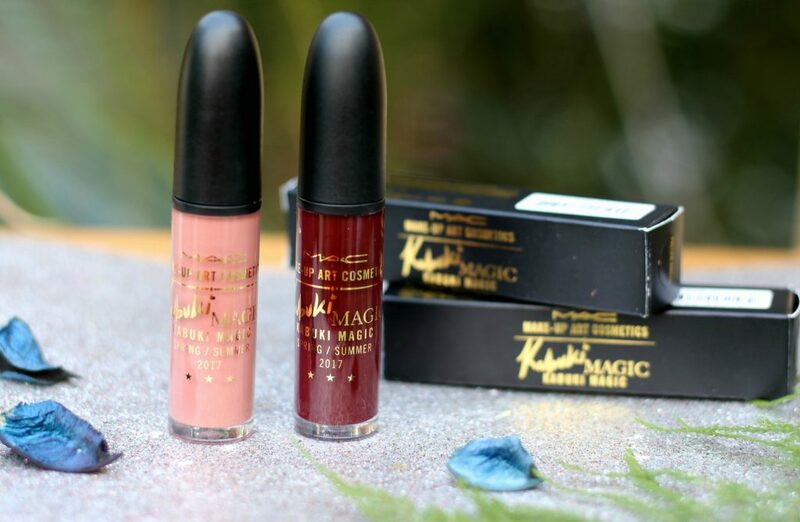 Now, M·A·C teams up with three makeup maestros – Diane Kendal, James Kaliardos and Kabuki – in collections reflecting their signature style. 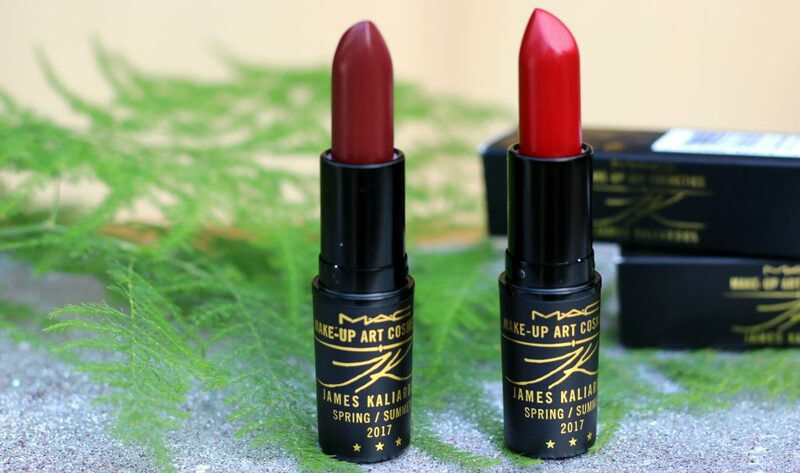 M.A.C Makeup Art Cosmetics Collection – Three legendary makeup artists — Diane Kendal, James Kaliardos, and Kabuki — have collaborated with MAC Cosmetics to release their own individual Make-Up Art Cosmetics (yep, that’s MAC’s full name) color collections representing their signature styles. 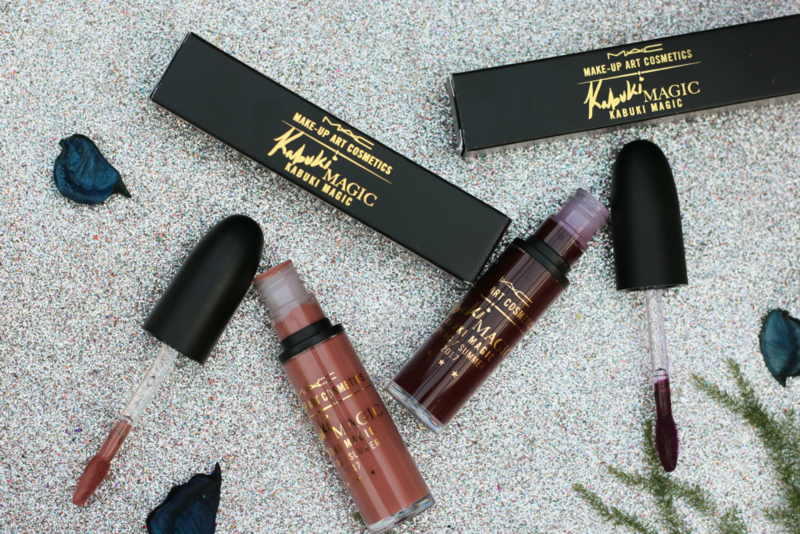 Kendal’s rich and vibrant eyeshadows, Kabuki’s bold and punchy lip paints and Kaliardo’s sensual neutrals completes this magical collection. 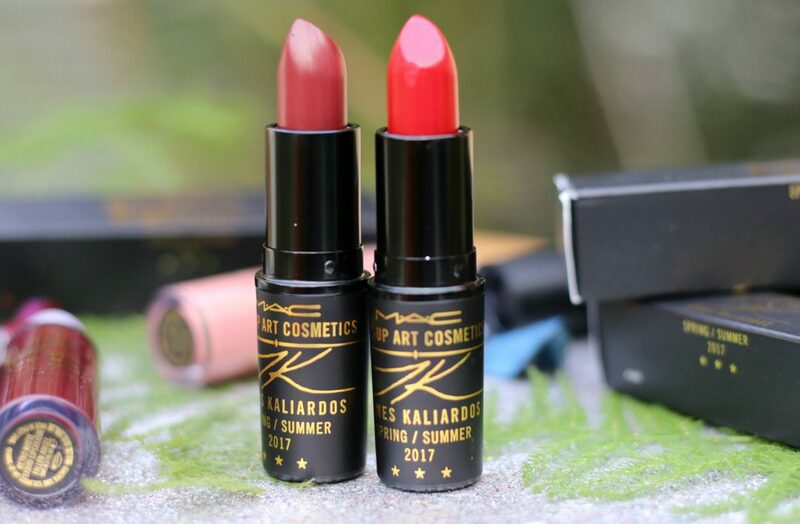 MAC James Kaliardos Lipsticks are designed by James Kaliardos, makeup artist. 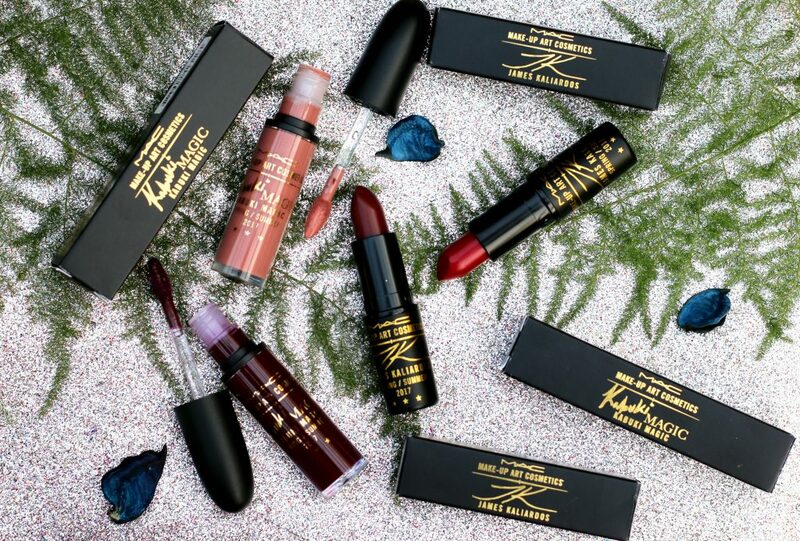 These are part of 50-piece limited edition MAC Makeup Art Cosmetics Collection. 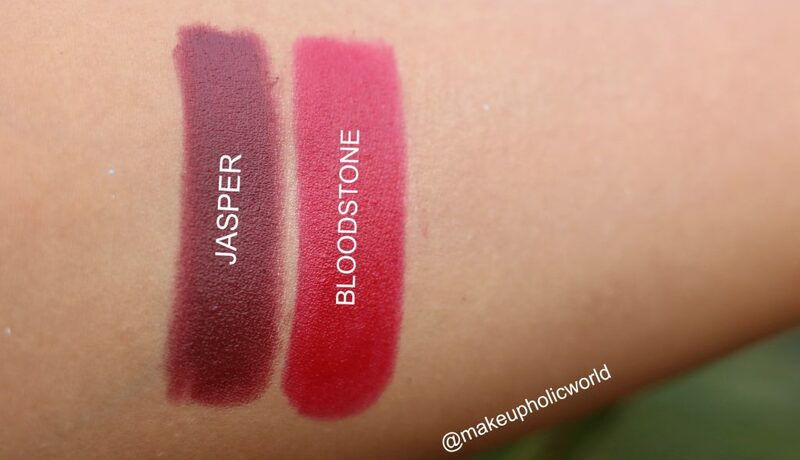 There are 4 shades of lipsticks available out of which I am going to feature two here. They come packaged in a black bullet with James Kaliardos gold color signature. 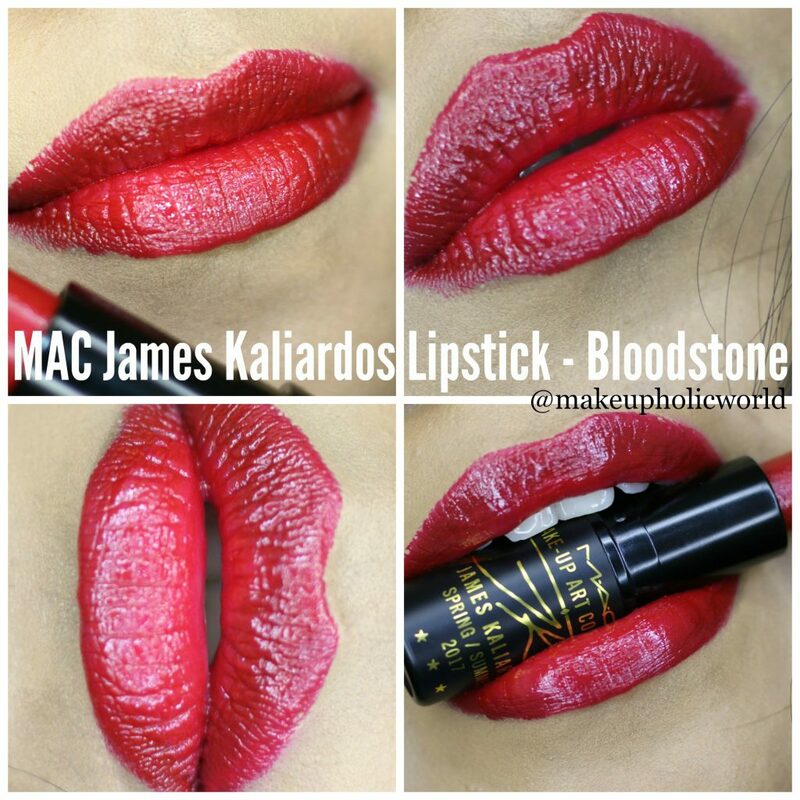 MAC Lipstick , Bloodstone is described by MAC as a deep, pinky-red with cool undertones. It has semi-opaque pigmentation. 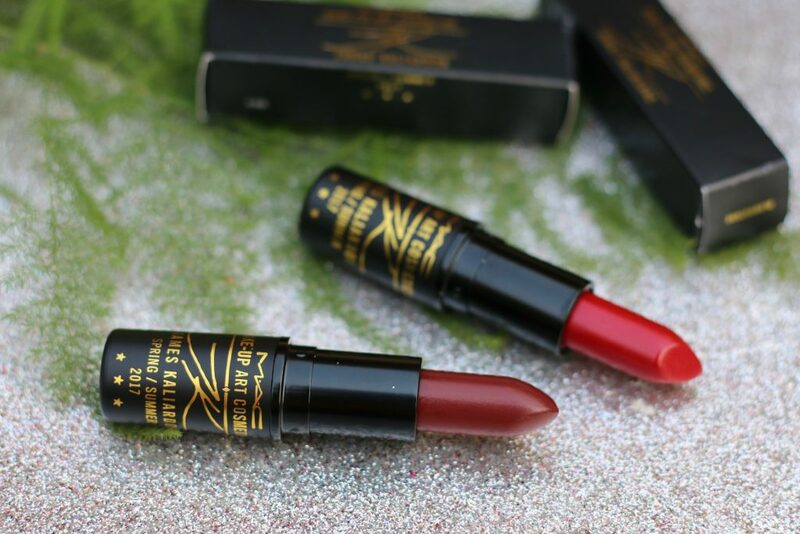 Though it is very creamy in texture and applies smoothly straight from the bullet. In extreme humid weather conditions of India, I found this lipstick to be melting pretty fast. I meant, while clicking pictures in my backyard, I found the lipstick changing its shape. It’s base almost uprooted. MAC was kind enough to send me a replacement when I told them about this. 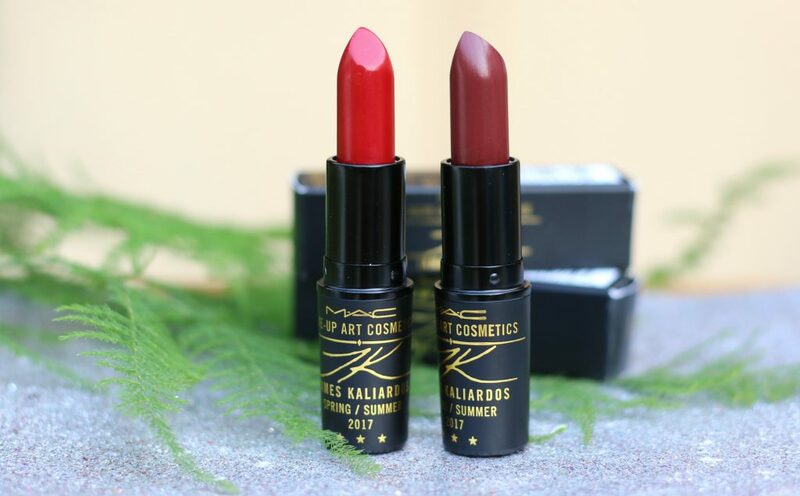 So, if you live in a place with humid or sultry weather, make sure you refrigerate this lipstick. 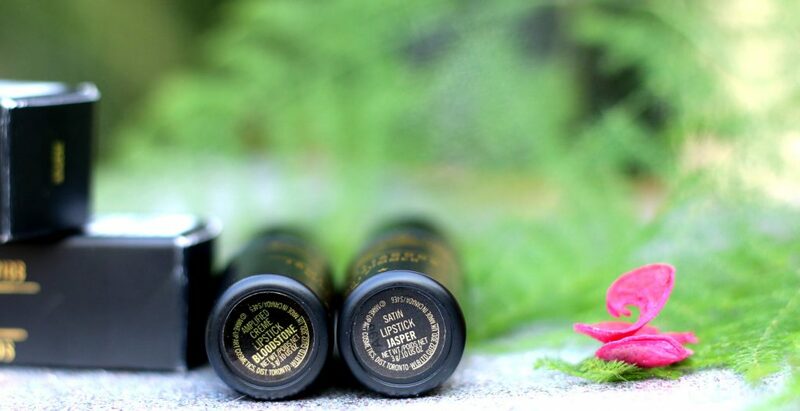 The texture felt creamy, very lightweight, smooth and easy to spread on lips. I found the formula to be quite hydrating. It’s a cool tones red. A universally flattering shade. However, as it has an amplified finish, I found that the shade transfers a little bit. It lasted about 5 hours on my lips surviving a light snack. If you are planning to apply this, Be sure you blot your lips after application to prevent it from transferring to cups etc. 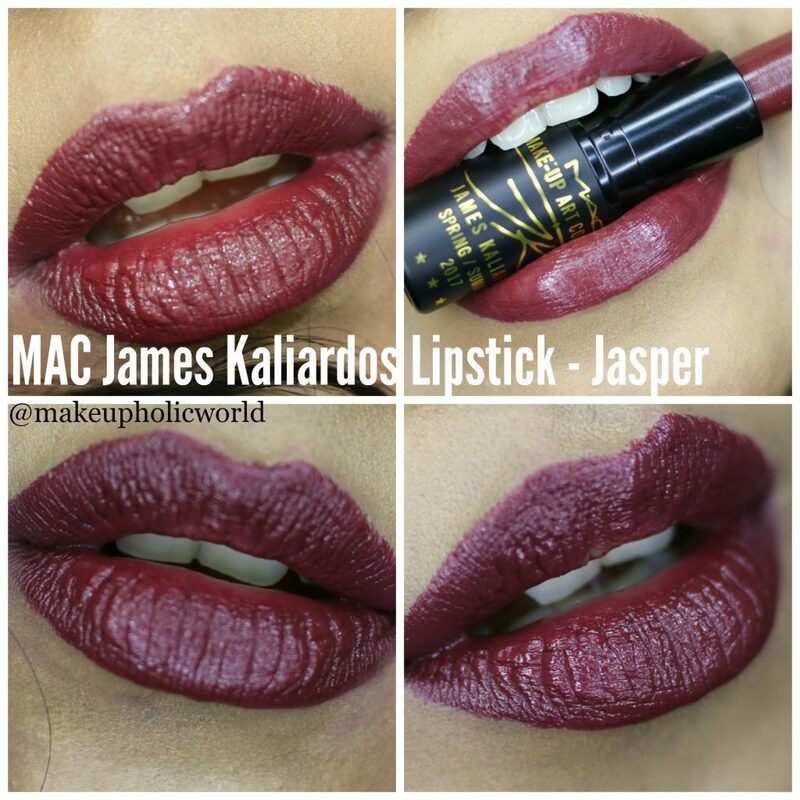 MAC Lipstick , Jasper is described by MAC as a deep, reddish burgundy with cool undertones and a creamy finish. Now, this is my favorite color from this entire range and I have already worn it quite a lot of times already. It has a opaque pigmentation with a smooth and creamy consistency. Super easy to spread and apply on lips. The shade is very very long lasting. Formula left behind a beautiful stain and it was not too hydrating on my lips, not too drying either. It’s a reddish brown shade according to me that looks gorgeous on Indian skin tones. 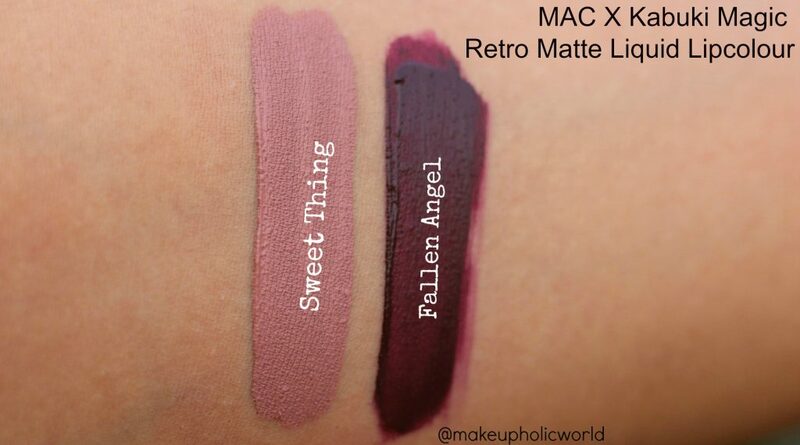 M.A.C Makeup Art Cosmetics Retro Matte Liquid Lipcolours – Fallen Angel & Sweet Thing has the matte texture. This collection features shades from mid-tone stone grey to purplish magenta. I decided to settle for 2 shades. 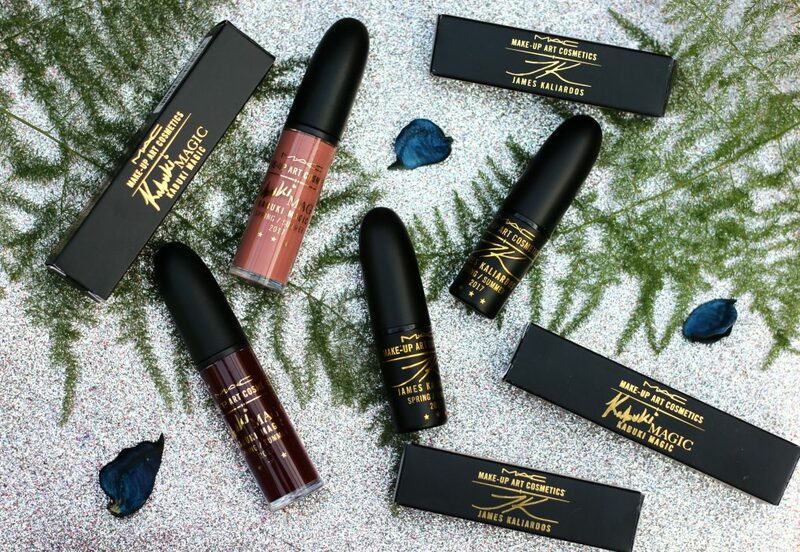 Packaging – These liquid lipcolors are packaged in a tube with matte black top and the glass /hard plastic tube has Kabuki’s signature in gold. 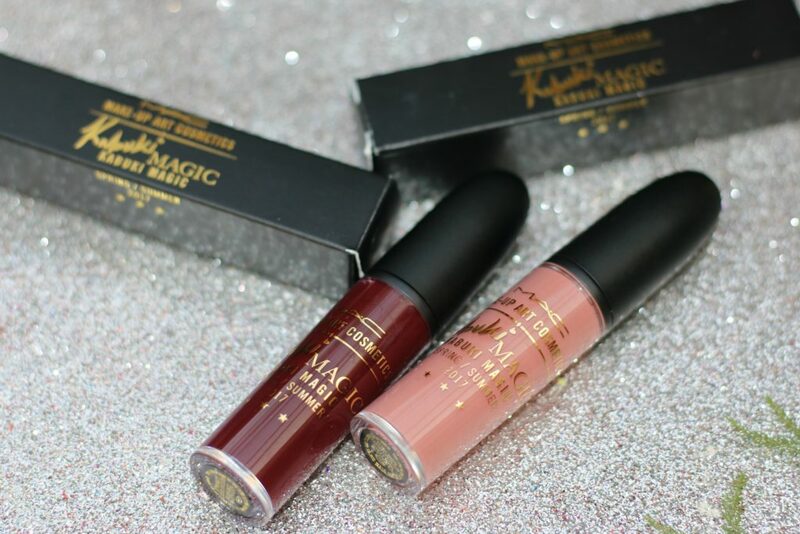 Sweet Thing – MAC claims it to be a long-wearing formula that lasts upto eight hours. Non-feathering, non-bleeding etc. 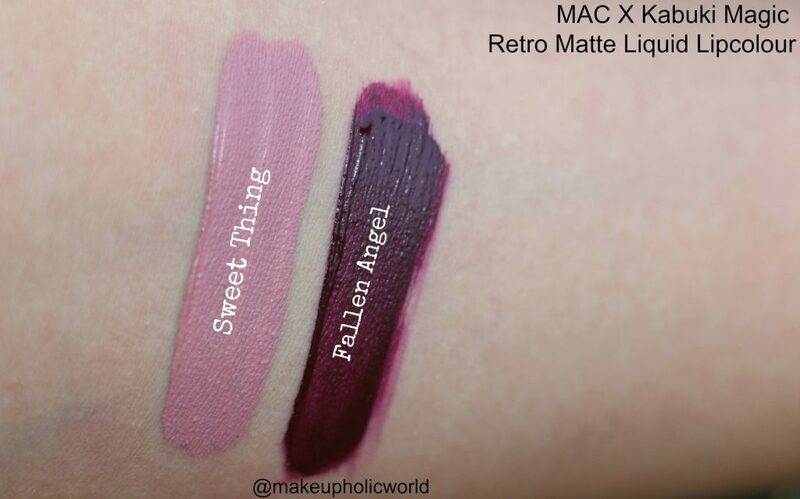 MAC Retro Matte Liquid Lipcolour Sweet Thing is a light peachy rose shade. Though MAC describe it to be of a brown shade. It’s more of a light peach rose on my lips. 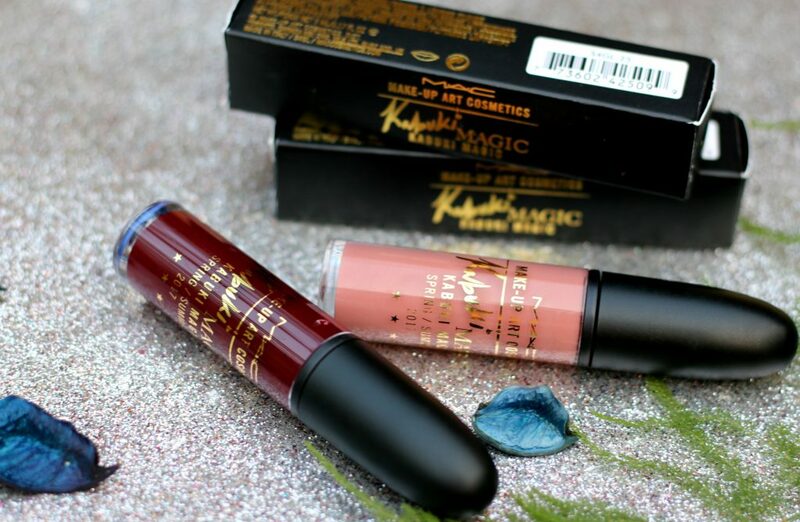 It had opaque pigmentation that applied evenly and smoothly to the lips. I found the application or the consistency to be smooth and easy to apply. 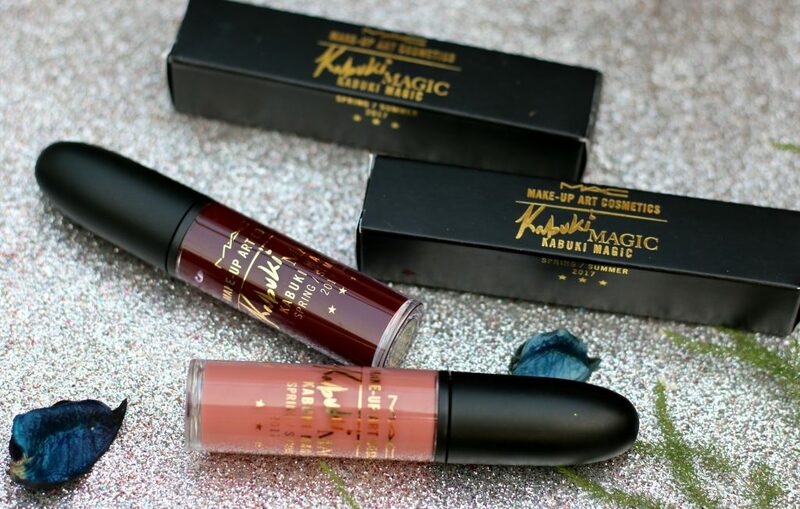 The formula is extremely lightweight and thus it was easy to apply on to the lips . I can’t deny the fact that it was drying on my lips. But, never felt it to be cracked while on my lips. It fairly lasted upt0 6 hours on my lips, survived a heavy South Indian meal. I also have to bring to your attention that – This is not a kind of the color that would suit most Indian tones. I liked it on my lips. I also love to top it over a dark lip liner to give that warm rose brown look. 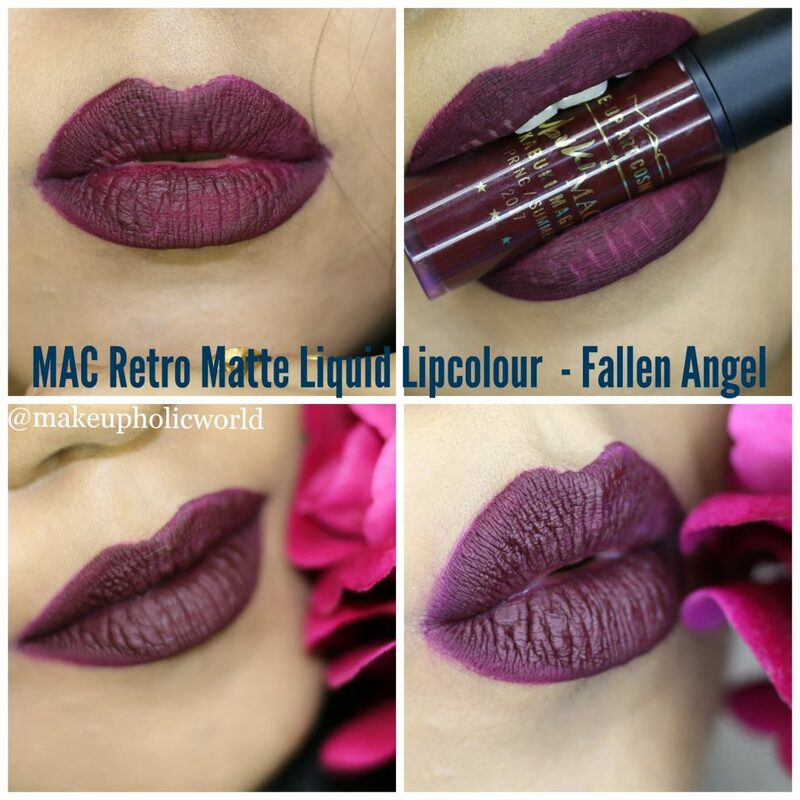 Fallen Angel – MAC describes ‘Fallen Angel’ as a deep berry color with cool undertones and a matte finish. The color is gorgeous. Almost a vampy color. But, I really wish MAC made the formula better. I found the formula to be slightly thinner and harder to apply to the corners and spread it evenly. It stained my lips and was extremely drying. It sort of looked like cracked color on my lips. I found the wear time to be very poor as well. As the formula was streaky, harder to control and apply plus the extremely dry nature of it. It was a total mess in my opinion. Here’s a sneak peak of makeup artist, Kabuki with his magic brush strokes. 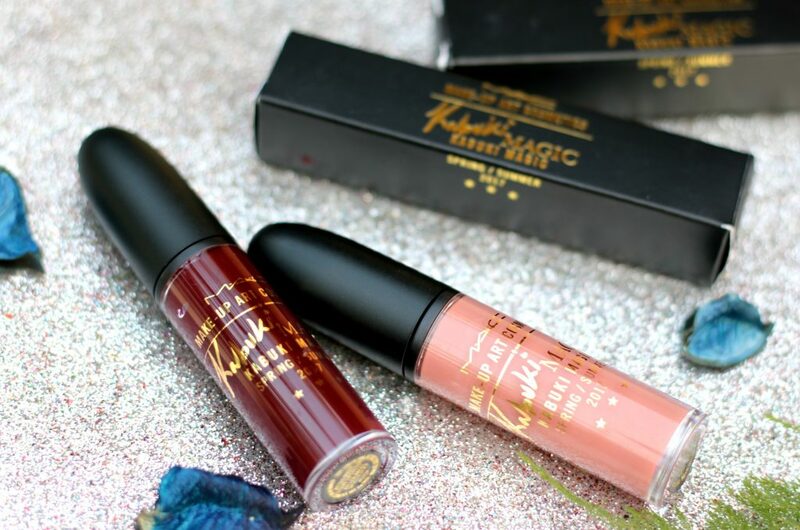 Have you tried anything from MAC Make-up Art Cosmetics Collection ? ** All products are purchased by myself.